Doumu Pottery is one of the traditional brand products in Qianshan County. The Tang Dynasty poet Li Bai had appreciated Shu state wine sets Doumu Pottery is one of the traditional brand products in Qianshan County. The Tang Dynasty poet Li Bai had appreciated Shu state wine sets as "Li Bai is willing to accompany Shu state (i.e. earthenware wine sets) Li Shi pan for life and for death." Pottery has a long history, while Doumu Township was the birthplace of pottery handicrafts and a major producer, with a kind of unique clay resources and industrious and talented folk artists. Doumu Pottery dates back to 6,000 years ago, with generations of artists studying hard, improving it carefully, and continuing to carry it forward. Doumu Township thus has been called the "the hometown of pottery in the Southwest of Anhui Province." With the ancient name of "kiln", it is on the verge of Xuejiagang cultural sites，where covered many kilns with a long history. Doumu Pottery has a complicated production process, including selecting delicate and pure yellow clay as raw materials and md a total number of 14 steps, such as hand-washing, casting, drying, finishing, calendering, painting, sculpture and so on, which lasted 25 days. There are more than 40 kinds of ceramic technologies, which combine financial practicality, ornamental and technology, and fully reflect the creativity of folk pottery craft. 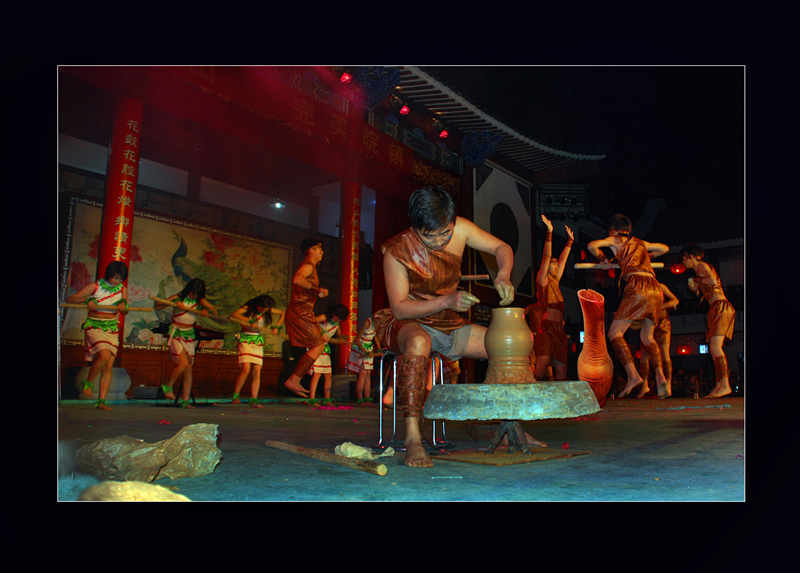 In 2008, Doumu Pottery production process was listed as Provincial Intangible Cultural Heritage.